Menzerna Polishing Cream is a German-made metal polish for all metals, precious metals, and plastics. The creamy metal polish works without abrasives to remove oxidation and stains to uncover a brilliant reflective shine! Menzerna polishes are produced in Germany, where the company abides by strict quality control standards. Consistency and quality are paramount because many of Menzerna’s car polishes are used in the auto plants of some major German car makers. The same kind of care and consistency goes into every tube of Menzerna Polishing Cream. Menzerna Polishing Cream is a unique blend of cleaning agents, lubricants, and proprietary ingredients that brings out a dazzling shine on all polishable metals! Use Menzerna Polishing Cream to polish brass, gold, silver, aluminum, magnesium, pewter, chrome, sterling, copper, stainless steel, fiberglass, and other unpainted plastics. Menzerna Polishing Cream is nonabrasive and gentle on all your vehicle’s metal surfaces. Menzerna Polishing Cream creates a reflective shine on chrome, stainless steel, and aluminum! Menzerna Polishing Cream is for ultra fine polishing. If the metal surface you’re working on has rust and heavy discoloration, you may need to use a more aggressive metal polish first, like Wolfgang MetallWerk™ Aluminum Compound. Completely buff off the compound and then apply Menzerna Polishing Cream to enhance the shine. For regular metal maintenance and shine enhancement, Menzerna Polishing Cream is all you need. To use Menzerna Polishing Cream, apply a very small amount to the desired surface with a soft foam or cloth applicator. Spread the metal polish over the surface. Then rub off the polish with a soft, dry Cobra Microfiber Towel until the surface is completely clean. Wipe on Menzerna Polishing Cream in a thin coat. 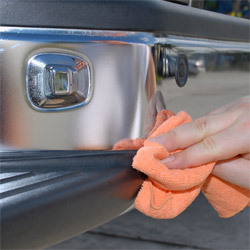 Buff off polish with a soft Cobra Microfiber Towel. Menzerna Polishing Cream leaves a clear protective film over the polished surface to prevent tarnishing. Metal surfaces stay clean, shiny, and smooth with regular use. Menzerna Polishing Cream is excellent for motorcycles! 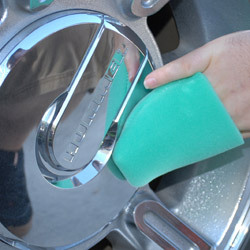 The metal polish safely cleans chrome and leaves it with a brilliant, highly reflective shine. Clean, polish, and protect all your uncoated metals and plastics with Menzerna’s only metal polish, Menzerna Polishing Cream. Menzerna Polishing Cream easily removed oxidation from the chrome exhaust tips on Max's Corvette. About Menzerna Polishing Compounds of GermanyJescar Finishing ProductsGerman Deep Gloss ComboGerman Final Gloss ComboMenzerna Ceramic Intro KitMenzerna Fast Gloss ComboMenzerna One-Step Polish 3-in-1 8 oz.Menzerna One-Step Polish 3-in-1 32 oz. Menzerna Super Heavy Cut Compound 300 8 oz.Menzerna Heavy Cut Compound 400 8 oz.Menzerna Medium Cut Polish 2400 32 oz.Menzerna Medium Cut Polish 2400 128 oz.Menzerna Super Finish (SF-3500) 8 oz.Menzerna Super Finish (SF-3500) 32 oz. Menzerna Super Finish (SF 3500) 128 oz. Menzerna Super Finish Plus (SF-3800) Menzerna Control CleanerMenzerna Super Heavy Cut Compound 300 32 oz.Menzerna Heavy Cut Compound 400 32 oz.Menzerna Heavy Cut Compound 1000 32 oz. Incredible as with all Menzerna products. Perfect for that final shine and protection on my HD motorcycle chrome. I also used it to remove the haze on my headlights !! Easy on and easy off, no mess. This product delivers as advertised. Another great polish from menzerna. I was able to polish by billet grill on my truck to a high shine.